Kurecoin is the newly launched decentralized cryptocurrency in the market that has recently launched their ICO on April 1st, 2018. Based on the Proof of Stake algorithm (PoS), it offers the entire cryptocurrency community a seamless and secured mode of transaction for investors within the KurecoinHub ecosystem and other major exchanges. The ICO will last for 100 days and the token sale will be in four stages, each with different amount of bonus. In phase 1, the investors will get 20% bonus by purchasing the KRC token and the subsequent phase 2, phase 3 and phase 4 will have 15%, 10% and 5% of bonus. In addition, the referral program offers 10% of the total token purchase to the users when they use the referral link. Kurecoin aims to build a strong community of users by the end of 2018 and allows seamless exchange of Bitcoin and other cryptocurrencies on KureCoin Exchange. It also enables periodic profit sharing from Kurecoin bank and Kurecoin exchange to the coin holders. The use of Proof of Stake mining also ensures the security of the blockchain. Kurecoin also strives to solve the challenges related to banking, trading, and exchange faced by the rapidly growing cryptocurrency users around the globe. The low maximum supply coupled with the KRC utility token is expected to kick off inflation from the ecosystem but at the same time, welcome a healthy growth and better valuation of the coin. 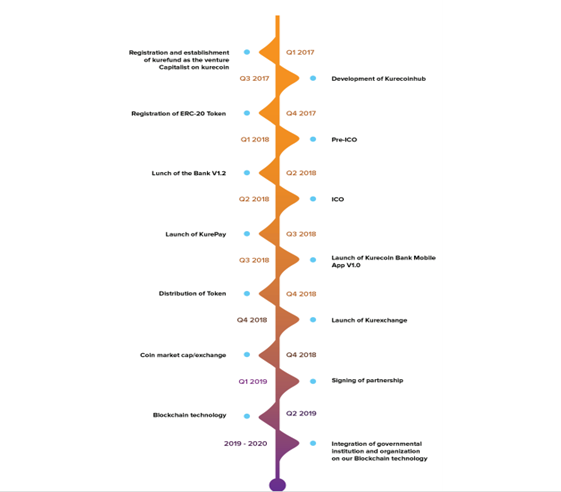 The coin is backed by a team of expert professionals and a systematic corporate culture where no more than 15% of the resources are allocated to the maintenance of current operational activities and the rest of the resources are deployed into research and development of a new stack of technologies. Kurecoin provides a platform called the KurecoinHub, for financial activities in both cryptocurrency and fiat. The platform also offers collateral free loans in fiat currency to the users that bank their assets on the platform, and get periodic dividends from it. The Kure exchange on the other hand, overcomes the complexities of the conventional exchanges by offering a platform that is easy to use for both seasoned and newbie traders. Being based in Africa, the goal of Kure Exchange is to house as many cryptocurrencies as much as possible from Africa and beyond. Another feature of Kurecoin is Kure Pay option which is a complete payment solution that includes an E-wallet, payment gateway and a debit/credit card. Unlike the other platforms where the payment options are listed on websites and the wallet addresses are displayed on such website, the Kure Pay wallet is embedded in one platform so that the merchants are not exposed to the risk of displaying their wallet addresses publicly. Additionally, the KurePAY card can be used anywhere in the world. With the Proof of Stake mining of Kurecoin the network security of the blockchain is guaranteed. Positioned to aggregate millions of users by the end of 2018 and beyond. KurePAY card can be used anywhere in the world. 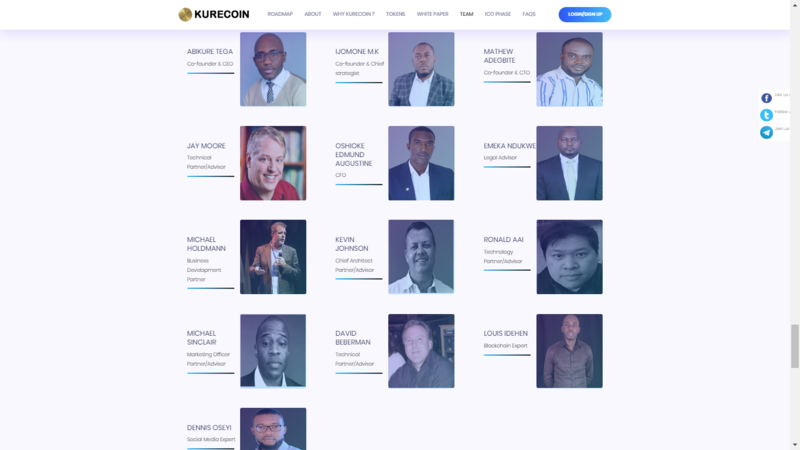 At kurecoin, we are set to tokenize the business world one sector at a time; as we are poised to be the number one in this through our multi-facet block-chain infrastructure. Peer to peer exchange of kurecoin to Bitcoin and other cryptocurrencies on KUREX platform.. Periodic profit sharing from Kurecoin bank and kurecoin exchange to coin holders. Kurecoin is a new decentralized cryptocurrency built with a proof of stake algorithm for investors and the entire cryptocurrency community in the KureCoinHUB ecosystem. Kurecoin is aimed at solving banking, trading and exchange challenges faced with the ever growing cryptocurrency users globally. As a valuable digital asset, Kurecoin’s value shall appreciate as the community in the KureCoinHUB increases across the globe. The low maximum supply coupled with the token being a utility token, is expected to kick o inflation from the ecosystem but at the same time, welcome a healthy growth and better valuation of the coin. KurecoinHub is a platform for financial activities both in cryptocurrency and in fiat which give users the option to buy and sell and bank cryp- tocurrencies. The platform also o ers collateral free loans in fiat to users that bank their assets on the platform. Using Kurecoin hub, users will be able to bank their cryptocurrencies and periodically get dividends on each of the crypto- currency they have banked on the platform. The hub has the option that o ers collateral free loans to users if and when a need arises or a user wishes to venture into any business and requires fiat. This loan is available up to 50% of every cryptocurrency banked on the platform. Most cryptocurrency platforms o er users the opportunity to purchase one or two cryptocurrencies and di erent wallet addresses are required during a transfer of those cryptocurrencies. Kurecoin Hub however solves that problem by making it seamless and easy for users to purchase up to 5 cryptocurrencies – where many more will be added, and individual wallet addresses are not required. In summary, the hub allows users to; buy, sell, bank as many crypto- currency as purchased and users can request for loans in fiat. Token sale will be in two phases with di¬erent bonuses in each stage. In Phase 1 of the token sale, investors will get 45% bonus of KRC token purchased. Phase 2 comes with 35% bonus for investors. In addition, our referral program o¬ffers 10% of the total token purchased to users when a referral link is used. Team seems to be the strongest part of this project. It consists of innovative and talented people. Of course I cannot complain if we talk about their professional level, guys indeed are experts on their field.